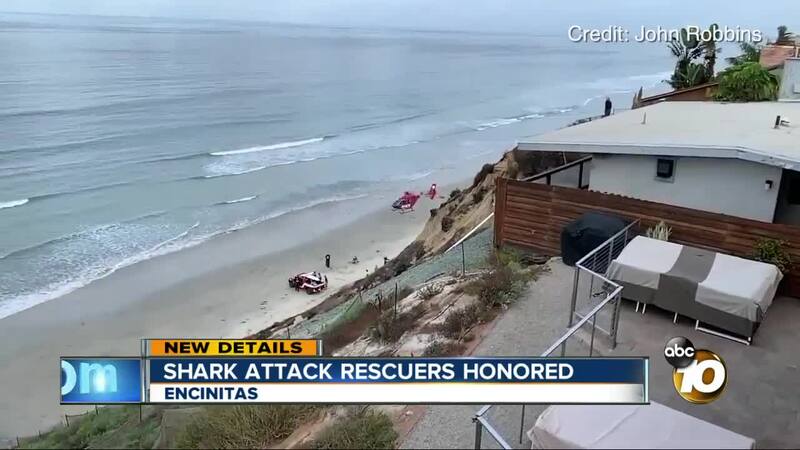 ENCINITAS, Calif. (KGTV) - The Encinitas City Council honored three men Wednesday night who helped save a teen who was bitten by a shark. Encinitas Mayor Catherine Blakspear presented proclamations to Chad Hammel, Matthew Ephron and Andrew Helble. The three of them were in the ocean the morning of Sept. 29 off the coast of Beacon’s Beach. It was the first day of lobster season and 13-year-old Keane Hayes was out diving with his friend. That’s when a great white shark bit his left shoulder. He was airlifted to Rady Children’s Hospital in critical condition but has made a nearly full recovery. At the city council meeting, Hayes was also honored with a proclamation of bravery from the mayor. He said he eventually plans to go back in the ocean, though probably not at Beacon’s Beach, he joked.